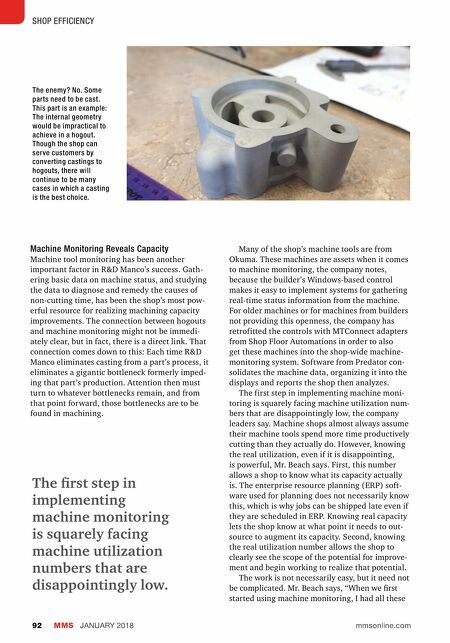 Converting Castings to Hogouts Modern Machine Shop 93 different codes for identifying the reasons for downtime." The graphic display became a rainbow that identified (or claimed to identify) an entire spectrum of different reasons why a machine might not be cutting. "It was too much," he says. His out-of-cut definitions did not necessarily provide a good fit with what was actually hap- pening at the machine. He realized instead that, essentially, "out-of-cut time is out-of-cut time." In any situation where there is too much of it, the reason ought to be found and addressed. 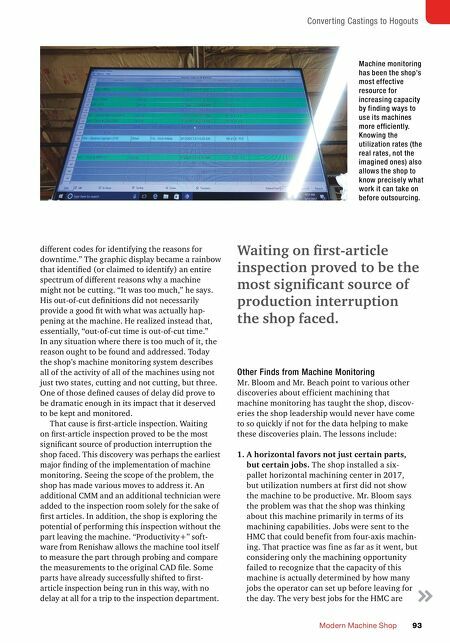 Today the shop's machine monitoring system describes all of the activity of all of the machines using not just two states, cutting and not cutting, but three. One of those defined causes of delay did prove to be dramatic enough in its impact that it deserved to be kept and monitored. That cause is first-article inspection. Waiting on first-article inspection proved to be the most significant source of production interruption the shop faced. This discovery was perhaps the earliest major finding of the implementation of machine monitoring. Seeing the scope of the problem, the shop has made various moves to address it. An additional CMM and an additional technician were added to the inspection room solely for the sake of first articles. In addition, the shop is exploring the potential of performing this inspection without the part leaving the machine. "Productivity+" soft- ware from Renishaw allows the machine tool itself to measure the part through probing and compare the measurements to the original CAD file. Some parts have already successfully shifted to first- article inspection being run in this way, with no delay at all for a trip to the inspection department. Other Finds from Machine Monitoring Mr. Bloom and Mr. Beach point to various other discoveries about efficient machining that machine monitoring has taught the shop, discov- eries the shop leadership would never have come to so quickly if not for the data helping to make these discoveries plain. The lessons include: 1. A horizontal favors not just certain parts, but certain jobs. The shop installed a six- pallet horizontal machining center in 2017, but utilization numbers at first did not show the machine to be productive. Mr. Bloom says the problem was that the shop was thinking about this machine primarily in terms of its machining capabilities. Jobs were sent to the HMC that could benefit from four-axis machin- ing. That practice was fine as far as it went, but considering only the machining opportunity failed to recognize that the capacity of this machine is actually determined by how many jobs the operator can set up before leaving for the day. The very best jobs for the HMC are Machine monitoring has been the shop's most effective resource for increasing capacity by finding ways to use its machines more efficiently. Knowing the utilization rates (the real rates, not the imagined ones) also allows the shop to know precisely what work it can take on before outsourcing. Waiting on first-article inspection proved to be the most significant source of production interruption the shop faced.